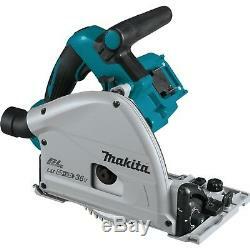 Makita Battery Plunge Saw DSP600 Zj 56mm Handheld Circular 2x18V Li-Ion Makpac. The description of this item has been automatically translated. Battery-diving saw 2x18V / 56 mm. ADT automatic torque drive technology. During operation, the speed is automatically regulated to achieve optimal performance depending on the request. Brushless motor for more A USD except, longer life and compact design. Intersection remains at all angular settings at exactly the same place. Angle adjustment from -1 ° to +48 ° (undercut function). Angle quick adjustment for-1 °, 2 2.5 ° and quick selection of 45 ° or 48° than maximum tilt angle. By marking mode for splinter-free cuts. Tilts not cope with your largest angle of inclination of the guide rail. Constant electronics, soft start and overload protection. 2,500 -6.300 min. Saw blade diameter / bore. 346 x 241 x 272. 2,5 m / s ². 1,5 m / s ². The item "Makita Battery Plunge Saw DSP600 Zj 56mm Handheld Circular 2x18V Li-Ion Makpac" is in sale since Wednesday, January 9, 2019. This item is in the category "Home, Furniture & DIY\DIY Tools & Workshop Equipment\Power Tools\Saws & Accessories\Circular Saws". The seller is "niggeldon" and is located in Hamburg. This item can be shipped to European Union member countries.